Would agriculture jobs be affected by the use of robots? Most developed countries have seen labor participation in agriculture decline rapidly in the past 100 years, and this is not just a case of automated machinery eliminating human jobs; it’s not that simply, United Nations reports that 54% of the World population lives in urban areas, and this proportion is expected to increase to 66% by 2050. Many young workers in developed countries aren’t choosing jobs on farms, therefore this countries may need robots to help feed the growing world population as the available agricultural workforce shrinks. Although, this could also mean that more agricultural workers will be needed in developed countries as skilled workers. In 1900 around 41% of U.S. workers had jobs in agriculture, according to a report of the MIT. By 2000 that figure had fallen to 2%. The U.S. Bureau of Labor Statistics estimates that the U.S. will lose approximately 110,500 jobs in agriculture and related industries between 2014 and 2024. In other words, agriculture’s share of all U.S. jobs will decline from 1.4 percent to 1.3 percent in that 10-year timeframe. Nowadays a growing number of agricultural robots have boosted farming efficiency across the world, helping human drivers auto steer tractors in U.S. cornfields or replacing human workers picking strawberries on Japanese farms where agricultural labor is both scarce and expensive and the average ag worker is over 70 years old. But the rise of agricultural robots does not necessarily mean human workers will vanish from farms anytime soon. Robots can enable farms to become much more productive with fewer or the same number of human workers, “there are really few tasks where a robot couldn’t perform as well as a human, they can take heavy physical task, or health-risky such as pesticide spraying” says Sara Olson, analyst at Lux Research. “But on the flipside, most growers will not cede total control to robots; that’s why we’ve seen technology augment and assist rather than replace human labor.” Such advantages have helped boost a worldwide market for agricultural robots that was worth approximately $3 billion by the end of 2015, according to a report by the market intelligence firm Tractica. Forecasts suggest the market could jump to almost $17 billion by the end of 2020 and nearly $74 billion by 2024. Proliferation of robots does not automatically mean wholesale replacement of human agricultural workers. But many farms will still need human field hands. If a robot in a factory messes up a production run, the factory can simply correct the error for the following runs. But if a farming robot malfunctions during planting or harvesting, it could potentially wipe out a significant chunk of an entire crop—and a farm’s seasonal income. Still, robotic assistance already makes good business sense for many large farming operations. About 10% of U.S. corn growers use GPS-guided Autosteer technology to help human drivers keep tractors and harvesting machines moving in straight lines and boost the accuracy of crop row spacing. Such technology sells for around $10,000 to $20,000 per machine and can pay off because of improved work efficiency and higher crop production. The average cost difference between Autosteer-assisted driving and the labor cost of humans doing manual driving could become negligible by around 2020. 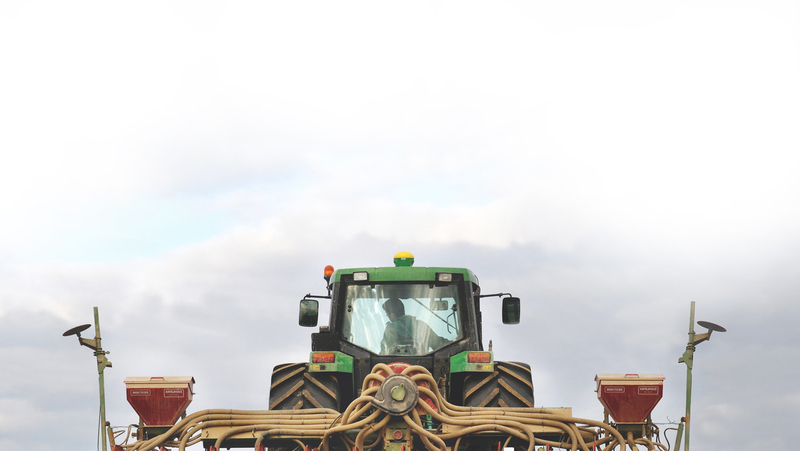 Improvements in automated steering and collision-detection sensors—perhaps leading to self-driving tractors—could eventually eliminate the need for a human driver on each tractor or harvester. Environmental and health regulations also play a role in the rise of agricultural robots. In Europe laws that limit the use of agricultural chemicals and the exposure of human workers to such chemicals have already made lettuce-weeding robots competitive with human labor, and without the need for chemicals. For Twin Brook the automatic milking system represented $5,000 per month savings on labor costs, and just as importantly, the cows have been producing 20% more milk, aside of other advantages like automatically monitoring and alerting farmers about cows’ possible health problems. But what happens in developing countries where labor cost are very inexpensive? Stands to logic that as long as paying labor wages are less costly than buying super-advanced and expensive equipment the human will be preferred and the jobs will remain. Some could argue that if you combine the Google Autonomous cars and a platform like Uber or Lyft, taxi driver as a profession doesn’t look very competitive in the near future. Others can say wherever there is risk there is opportunity…like for developing countries giving better education to their citizens so they can adapt to the new demands of the jobs in farms, like fixing and supervising robots. As we quoted Andrew Youn in a recent article “The greatest failure of the human race is the fact that we’ve left more than one billion of our members behind”. Will this trend lead to a biggest gap between automated and non-automated countries? Or will all the aforementioned factors lead to a better feed world? The debate is open, if you like to share or comment this article please join the conversation on our Facebook Page. The main point in here is; the robot cost could be come insignificants by the 2020 compared to human labor. By the way, there are not much jobs left for humans in the farms at present for the robots to replace. The greatest threat today for the rapid human job loss is in the Industrial, service, blue as well white collar Jobs. How do we tackle this problem of majority of our people becoming unemployed? Before which, the principle behind my theory is; the fruits of the societies technological progress should not be appropriated only by a few elite but it is their historical responsibility to see to it that the benefit should be equally shared among all members of the society. Do You Need To Know Your Cost of Production?